This adorable Tooth Fairy Pillow is made in the USA! 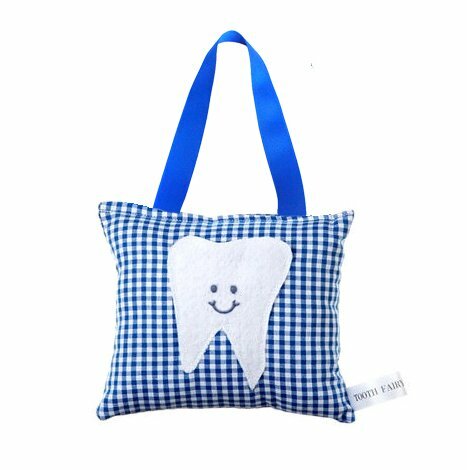 Hand crafted with meticulous attention to detail, this tooth fairy pillow is made from a classic royal blue and white checked print cotton and features a tooth shaped pocket to hold both lost tooth and Tooth Fairy treasure. This tooth fairy pillow measures approximately 6.5" x 6.5" and is made with 100% Cotton, and stuffed with ultra soft Polyfil. The hand embroidered felt tooth is a little pocket, perfect for keeping a lost tooth safe until the Tooth Fairy swings by. Cover is 100% cotton and pillow measures approximately 6.5" x 6.5"
Features a clever tooth pocket to hold both tooth and treasure! Decorative ribbon bow allows for easy hanging on any door, dresser, bed post or hanger. Makes a wonderful gift for boys or girls! If you have any questions about this product by Tooth Fairy Pillow Shop, contact us by completing and submitting the form below. If you are looking for a specif part number, please include it with your message.